13 days until Law School! In two weeks I will be entering the first classes of my professional career.... that is pretty hard to believe! The journey thus far has been one of many ups and downs but to be this close to finally starting Law School is very exciting. That being said, there is a ton of last minute stuff to get done! I have to get my new student ID but I am still waiting on my name change paperwork from getting married. I want to start the year with my new name but time is running out.... hopefully it all gets done in time! I finally have all of my books in hand! They were super expensive, are super heavy and are just a bit intimidating. I ordered all of my books new off Amazon except for one that I rented. Thankfully they were cheaper than I budgeted. Coming in at a whopping $150 was my one-semester parking pass.... my undergraduate college offered parking passes for free so this was an unpleasant surprise. The nice thing is that the passes do not have to be stuck on the car or hung on the rearview mirror. Somehow they just know. Pens, highlighters, folders, notebooks and all of the above. I have always loved school supplies shopping and this was no different. I wrote an entire post on my school supplies for Law School so reference that for specifics. This morning I received the email to set up my LexisNexis account. Now I feel like a real Law Student but the red Camelbak from orientation will really seal the deal. 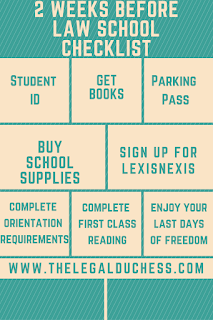 I read all about the LexisNexis rewards system and through online videos, tutorials and quizzes I have already amassed 800 points! We had some assigned reading and worksheets for the Mock classes and events in Orientation. I got them done to the best of my ability and it feels good to have it off my shoulders. Only 2 of my 5 classes have posted the assigned reading for our first class meeting. I am slowly working away at it a little at a time. Hopefully, the others will get posted soon so I don't have to do it all right before classes start. The assignments haven't been too bad.... so far. I only have 13 more days of no classes, homework and stress. I am trying to enjoy it as much as possible and spend time with my Hubby, my puppies, Netflix and getting my house in shape. Summer is coming to an end very soon... The Olympics are perfectly timed; I love watching them and it is a great way to wind down these last summer days. 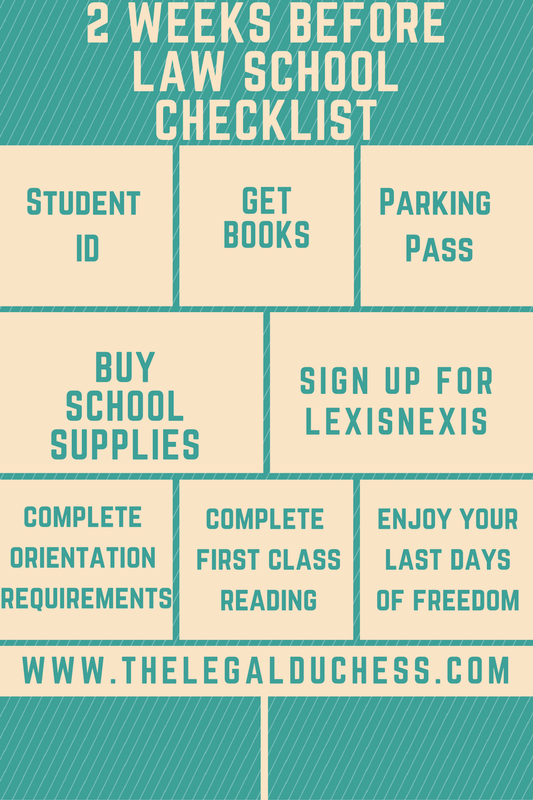 How are you preparing for Law School these final weeks?